زمان خان, حسام, آیتی, بیتا, گنجی دوست, حسین. (1391). تجزیه فتوکاتالیستی فنل به وسیله نانو ذرات روی اکسید تثبیت شده بر بستر بتنی. 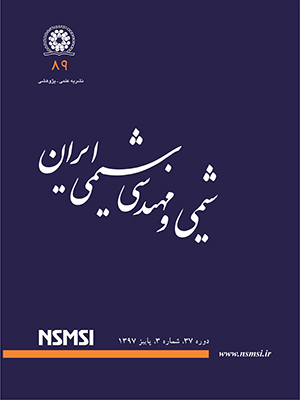 نشریه شیمی و مهندسی شیمی ایران, 31(3), 9-19. حسام زمان خان; بیتا آیتی; حسین گنجی دوست. "تجزیه فتوکاتالیستی فنل به وسیله نانو ذرات روی اکسید تثبیت شده بر بستر بتنی". نشریه شیمی و مهندسی شیمی ایران, 31, 3, 1391, 9-19. زمان خان, حسام, آیتی, بیتا, گنجی دوست, حسین. (1391). 'تجزیه فتوکاتالیستی فنل به وسیله نانو ذرات روی اکسید تثبیت شده بر بستر بتنی', نشریه شیمی و مهندسی شیمی ایران, 31(3), pp. 9-19. زمان خان, حسام, آیتی, بیتا, گنجی دوست, حسین. تجزیه فتوکاتالیستی فنل به وسیله نانو ذرات روی اکسید تثبیت شده بر بستر بتنی. نشریه شیمی و مهندسی شیمی ایران, 1391; 31(3): 9-19. فنل از جمله آلاینده ‌های خطرناک و سخت تجزیه پذیر است که حذف کامل آن به روش ‌های معمول امکان‌ پذیر نمی ‌باشد. در این پژوهش حذف فنل از فاز مایع به‌ وسیله فتوکاتالیست نانو روی اکسید مورد مطالعه قرار گرفت. از بتن به عنوان بستر تثبیت نانو ذرات استفاده شد و انرژی تابشی به‌وسیله لامپ UVتأمین شد. تاثیر پارامترها شامل غلظت ماده آلاینده، شدت تابش، مقدار ذرات ماده کاتالیست و pH مورد مطالعه قرار گرفت. در شرایط بهینه غلظت اولیه فنل 50 میلی‌ گرم در لیتر فنل، میزان ماده کاتالیست برابر 80 گرم در متر مربع، pHبرابر 11 و توان منبع تابش لامپ UV برابر 32 وات ، بازده حذف سامانه پس از گذشت 5 ساعت بیش از 90 درصد بود. Ksibi M., Zemzemi A., Boukchina R., Photocatalytic Degradability of Substituted Phenols over UV Irradiated TiO2, Journal of Photochemistry and Photobiology, 159, p. 61 (2003). Kuo-Hua Wang, Yung-Hsu Hsieh, Ming-Yeuan Chou, Chen-Yu Chang, Photocatalytic Degradation of 2-Chloro and 2-Nitrophenol by Titanium Dioxide Suspensions in Aqueous Solution, Applied Catalysis B Environmental, 21, p. 1 (1999). Poulopoulos S.G., Haque M.M., Muneer M., Bahnemann D.W., Photochemical Treatment of Phenol Aqueous Solutions Using Ultraviolet Radiation and Hydrogen Peroxide, Journal of Hazardous Materials, 129, p. 64 (2006). Priya S. Shanmuga, Premalatha M., Anantharaman N. Solar Photocatalytic Treatment of Phenolic Wastewater- Potential, Challenges and Opportunities, ARPN Journal of Engineering and Applied Sciences, 3, p. 112 (2008). Aghaei M., Khezri B., Zare K., Aghaei H., Kinetic Study of Photocatalytic Reduction of CO2 with H2O Using TiO2 Catalyst, Iranian Journal of Chemistry & Chemical Engineering (IJCCE), 30 (2), p. 89 (2011). Shukla P.R., Wang S., Ang H.M., Tade M.O., Photocatalytic Oxidation of Phenolic Compounds Using Zinc Oxide and Sulphate Radicals under Artificial Solar Light, Separation and Purification Technology, 70, p. 338 (2010). Gaya U.I., Abdullaha A.H., Zainala Z., Mohd Zobir H. Photocatalytic Treatment of 4-Chlorophenol in Aqueous ZnO Suspensions: Intermediates, Influence of Dosage and Inorganic Anions, Journal of Hazardous Materials, 168, p. 57 (2009). Lachheb H., Houas A., Herrmann J.M., Photocatalytic Degradation of Polynitrophenols on Various Commercial Suspended or Deposited Titania Catalysts Using Artificial and Solar Light, International Journal of Photoenergy, 88, p. 156 (2008). Peng Feng Wang, Hongjuan, Yu Hao, Shuihui Chen, Preparation of Aluminum Foil-Supported Nano-Sized ZnO Thinfilms and Its Photocatalytic Degradation to Phenol under Visible Light Irradiation, Materials Research Bulletin, 41, p. 2123 (2006). Parida K.M., Parija S., Photocatalytic Degradation of Phenol under Solar Radiation Using Microwave Irradiated Zinc Oxide, Solar Energy, 80, p. 1048 (2006). Salah N.H., Bouhelassa M., Bekkouche S., Boultif A., Study of Photo-Catalytic Degradation of Phenol, Desalination, 166, p. 347 (2004). Watts Michael J., Cooper Adrienne T., Photocatalysis of 4-Chlorophenol Mediated by TiO2 Fixed to Concrete Surfaces, Solar Energy, 82, p. 206 (2008)`. Rao K. Venkata Subba, Rachel A., Subrahmanyamb M., Boule P., Immobilization of TiO2 on Pumice Stone for the Photocatalytic Degradation of Dyes and Dye Industry Pollutants, Applied Catalysis B: Environmental, 46, p. 77 (2003). Park Sung, Park Hye-Jung, Yoo Kang, Lee Ju-Hyeon, Lee Jae Chun, Photocatalytic Recovery of Ag Ions from Wastewater Using ZnO Nano-Powders Immobilized on Micro-Porous Alumina Substrates. Colloids and Surfaces A: Physicochem. Eng. Aspects, 300, p. 30 (2007). Delnavaz M., Ayati B., Ganjidoust H., Sanjabi S., Comparison Between Epoxy and Waterproof Sealers in TiO2 Immobilization on Concrete Surface for Treating Phenolic Wastewater by Photocatalytic Process, Modares Civil Engineering Journal, 11 (2), p. 17 (2011) (in Persian). Hong S.S., Ju C.S., Lim C.G., Ahn B.H., Lim K.T., Lee G.D., A Photocatalytic Degradation of Phenol over TiO2 Prepared by Sol-Gel Method, Journal of Industrial and Engineering Chemistry, 7 (2), p. 99 (2001). Pardeshi S.K., Patil A.B., A Simple Route for Photocatalytic Degradation of Phenol in Aqueous Zinc Oxide Suspension Using Solar Energy, Solar Energy, 82, p. 700 (2008). Khodja A.A., Sehili T., Pilichowski J.F., Boule P. Photocatalytic Degradation of 2-Phenylphenol on TiO2 and ZnO in Aqueous Suspensions, Journal of Photochemistry and Photobiology, A: Chemistry, 141, p. 231 (2001). Barakat M.A., Schaeffer H., Hayes G., Ismat-Shah S., Photocatalytic Degradation of 2-Chlorophenol by Co-Doped TiO2 Nanoparticles, Applied Catalysis B: Environmental, 57, p. 23 (2005). Singh H.K., Saquib M., Haque M., Muneera M., Bahnemann D., Titanium Dioxide Mediated Photocatalysed Degradation of Phenoxyacetic Acid and 2,4,5-Trichlorophenoxyacetic Acid, in Aqueous Suspensions, Journal of Molecular Catalysis A: Chemical, 264, p. 66 (2007). Selvam K., Muruganandam M., Muthuvel I., Swaminathan M., The Influence of Inorganic Oxidants and Metal Ions on Semiconductor Sensitized Photodegradation of 4-Flurophenol, Chemical Engineering Journal, 128, p. 51 (2007). Bahnemann W., Muneer M., Haque M.M., Titanium Dioxide-Mediated Photocatalyzed Degradation of Few Selected Organic Pollutants in Aqueous Suspensions, Catalysis Today, 124, p. 133 (2007). Chiou C.H., Wu C.Y., Juang R.S., Influence of Operating Parameters on Photocatalytic Degradation of Phenol in UV/TiO2 Process, Chemical Engineering Journal, 139, p. 322 (2008). Kusvuran E., Samil A., Malik O., Atanur, Erbatur O., Photocatalytic Degradation Kinetics of Ddi- and Tri-Substituted Phenolic Compounds in Aqueous Solution by TiO2/UV, Applied Catalysis B: Environmental, 58, p. 212 (2005). Maciel R., Sant'Anna GL Jr., Dezotti M., Phenol Removal from High Salinity Effluents Using Fenton’ Sreagent and Photo- Fenton Reactions, Chemosphere, 57, p. 711 (2004).